Yes, we know you’re trying to hold on to the last bits of semi-warm weather before the fall temperatures come in full effect – but it’s time to “think fall” for your HVAC units. The last time you used your furnace was probably early spring, right? So who really knows the condition of your furnace at the moment? First, we recommend running your furnace. 79 degrees or higher is an ideal temperature to run when making sure your furnace is working properly. 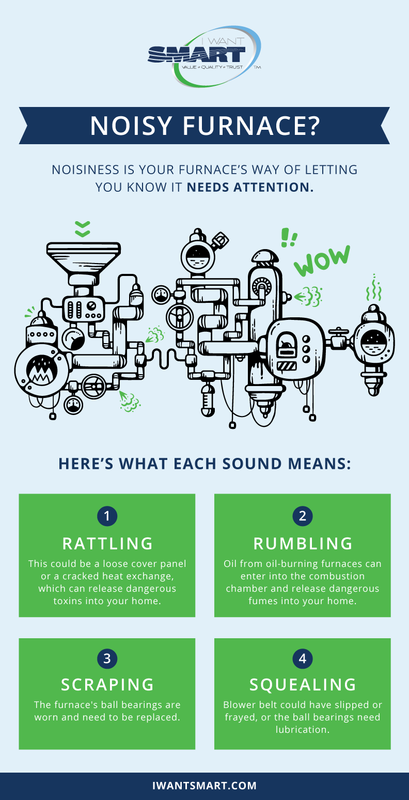 And while you’re running your furnace, the most important thing to do is to check for sounds. This will be the key factor in knowing whether your furnace needs to be repaired or replaced. The best way to know if your furnace needs to be repaired or replaced is by having a SMART technician stop by before cooler weather sets in. Reach out today. https://iwantsmart.com/wp-content/uploads/2016/10/NoisyFurnace_Cover.png 423 792 SMART https://iwantsmart.com/wp-content/uploads/2019/02/SMARTlogo-nav2019-300x146.png SMART2016-10-19 20:15:562017-05-03 19:15:34Noisy Furnace? Read This.